A mysterious X-ray source became 1,000 times brighter over a few hours before fading dramatically in about a day. This source was discovered in Chandra Deep Field-South data, giving the deepest X-ray image ever made. Hubble and Spitzer data indicate this source is likely located in a small galaxy about 10.7 billion light years from Earth. Evidence points to this being some sort of destructive event but perhaps unlike any ever seen before. 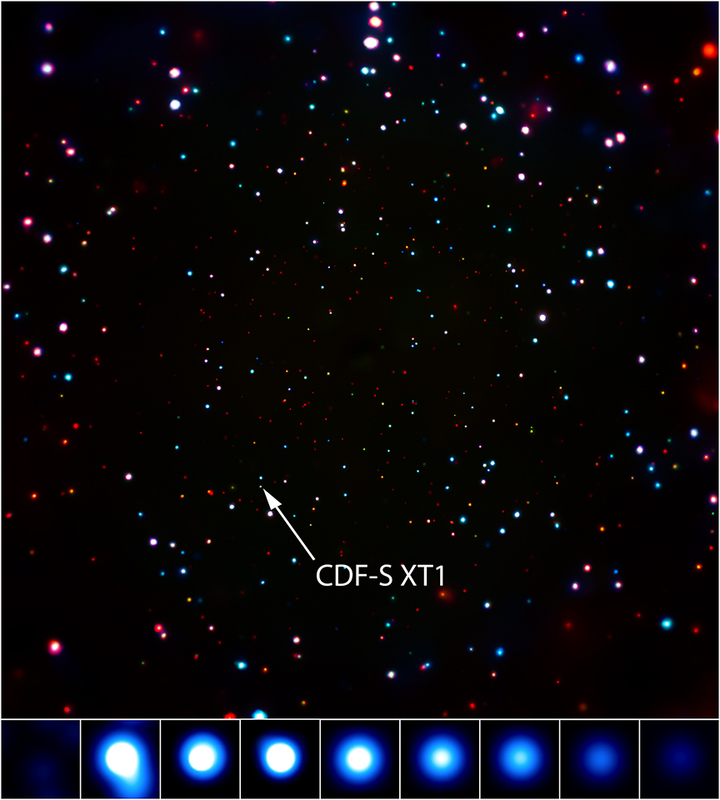 Credit X-ray: NASA/CXC/Universidad Cat�lica de Chile/F.Bauer et al. Coordinates (J2000) RA 03h 32m 39s | Dec -27° 51&apos; 34"
Observation Time Inset Image: 26 hours 7 minutes. What if two dying stars suddenly merged in a death spiral the length of the burst creating a rapid violent usage of of their remaining fuel and formed a black hole causing the fade. There seems to be some transit rotation during the burst in the video of the blue flash I saw at least. This is so thrilling and I must thank all the scientists who have made it possible for all of us to see the magic in our universe. Thank you for this. You're making America smart again. WOW... cool. I wish we knew what was in the Early Universe part. Why a white hole phenomenon isn't in the list of possible explanations? Could this be an actual visual representation of Hawkins release of information energy as death of a blackhole? This massive amount of energy could back that up correct. Is there any chance of this being a microlensing event? It just seems very similar it effect and time frame. Incredible observation from Chandra. Thank you for all the work. About 10.7 billion light years from Earth. Inset Image is 3.7 arcsec across.